Stan Davis, age 41 from Rhyl and friends will be embarking on a mammoth 177 mile trek to raise vital funds for Welsh veteran’s charity Change Step and they are hoping that local veterans and civvies will get behind them. Stan, a veteran of 21 Brigade support squadron, along with his fellow veteran pals Bobby Ball, 1st Battalion Stafford regiment and Mervyn Reed, 1st Battalion Royal Irish, have pledged to ‘live off the land’ for the entire 14 day challenge. The group will start out in Chepstow on the 10th August and from there, the friends will trek through the Black Mountains, over the Shropshire Hills and all the way over the Clwydian Range until they reach their destination point of Prestatyn. 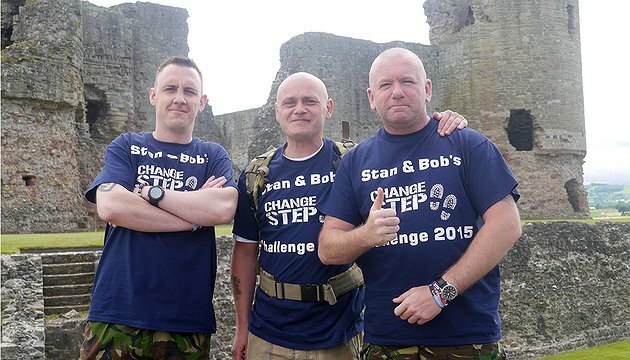 Stan, Bobby and Mervyn have all suffered from PTSD as a result of military service themselves, which is why they have chosen to raise money for Change Step as the charity supports Welsh veterans and their families who have been affected by this disorder. This will be the second challenge which Stan has embarked upon for Change Step, having completed a triathlon in aid of the veteran’s charity in 2013. Change Step Ambassador, and close friend of the veterans, Spencer Wilding has expressed his gratitude to the friends saying “I wish them the best of luck…and not too many blisters”. Ronnie Devlin, Peer Mentor for Change Step is so supportive of the initiative that he will be joining them, along with some of Change Step’s service users, for the final day’s hurdle, he informs “We are looking forward to joining Stan and the gang. It’s a tough trek, especially without any mod cons, phone signal or anything else; they will literally be living off the land, whatever the weather and I say well done lads”. Stan and his friends are hoping the public and their fellow veterans will support them by visiting their JustGiving page www.justgiving.com/Stan-Davies/ and donating whatever they can, in the hopes of achieving their target of £3000. All funds raised will go directly into Change Step’s veteran’s services and ensure that they can continue to provide veteran to veteran support, as well as essential support for family members. You can find out more by following their journey on Change Step’s Facebook and Twitter pages. A ‘Welcome Home’ celebration on the 24th August at 2.30pm is being hosted by The Barrel in Rhyl for the group and a warm invitation is extended to anyone who would like to come along.